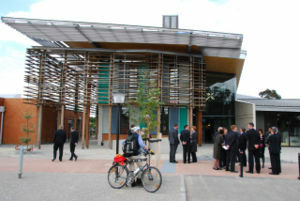 The Swinburne University National Centre for Sustainability and Environmental Design Building, located in Wantirna, Melbourne has been built with innovative sustainability features. 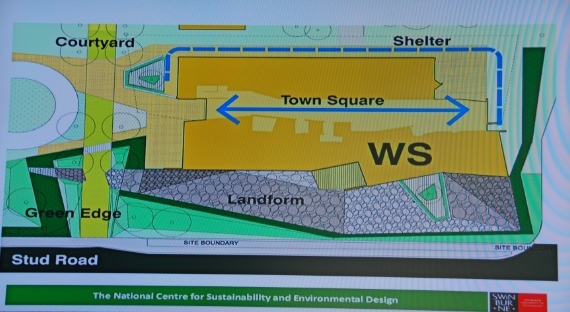 The building is the new home for staff of the National Centre for Sustainability. 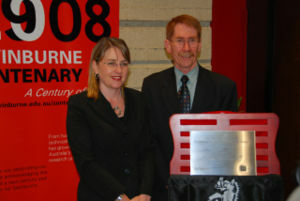 The grand opening for the building was held on October 14 2008 as part of the Wantirna's Centenary function. 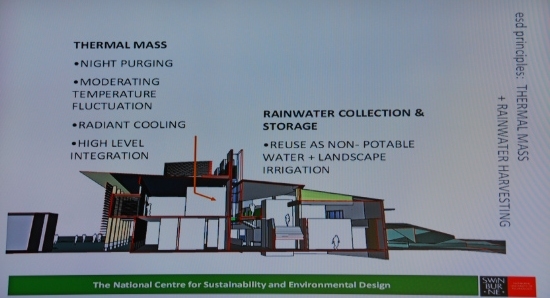 The building has been designed to sit unobtrusively in the surrounding landscape and boasts a range of sustainable features such as solar panels, water tanks, natural light and ventilation, drought resistant landscaping, waterless urinals, hydronic heating and external shading. Two existing buildings on the campus have also undergone significant renovations to create an environmentally-responsive administration and student services area. Solar panels and external shading made from low energy materials. Low velocity dispersement air flow system. 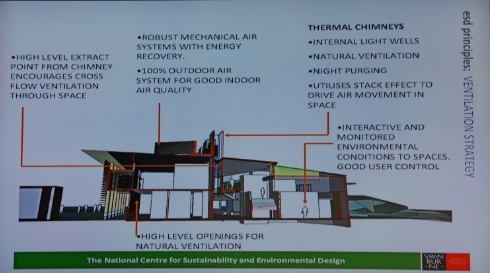 The atmosphere of the building uses basic physics to moderate and deliver fresh air to occupants. "Victorian industry will have the opportunity to become world leaders in sustainable and renewable technologies with the opening of the Brumby Government’s $12.6 million National Centre for Sustainability and Environmental Design at Swinburne University of Technology’s Wantirna Campus." "The new centre will play a key role in developing the skills Victoria needs to respond to the challenges of climate change." "We have invested $12.6 million to provide industry and the broader community with a working model of sustainability in action"
"While climate change presents Victoria with serious challenges, it also presents our industries with very real opportunities to become world leaders across a range of emerging sectors and for the creation of many green collar jobs". This page was last modified 03:45, 22 October 2008. This page has been accessed 36,290 times.